As we entered the venue for the Jaipur Literature Festival on the first day, we looked around, a bit nervously, for the perfect spot to make our first drop on behalf of the Mumbai chapter of The Book Fairies, a worldwide organisation which delights readers by sending them on the hunt for books they drop off at various locations with clues posted to their social media accounts. It wasn’t very crowded and, in fact, there seemed to be more security than visitors. The shopping area was bustling with vendors who were setting up their stalls. We thought about leaving a book there but realised that it would simply get buried in the chaos of the goods, only to be found later while packing-up. Publishers’ stalls were also not an option, as the book may have gotten mixed up with their copies. As we continued to explore, we chanced upon the perfect spot: a beautiful art installation. Two bronze peacocks standing on either side of a magnificent bronze tree. 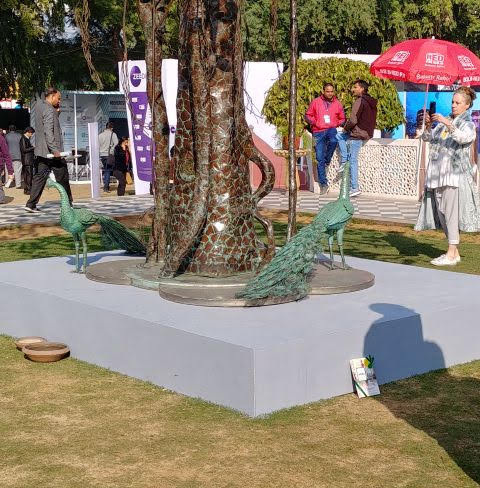 It was a spot where book-lovers, wannabe book-lovers, pretend book-lovers, and the, unfortunately, more common I-was-there-too folks could take selfies and post them on their social media feeds, with titles such as “Getting my #literature on @ZEEJLF #booklover #booknerd #Jaipur #JLF #Imintelligent #Imintellectual”. As we sat on a platform under the tree trying to figure where to leave the book, a security guard shooed us away informing us that we cannot sit here as the spot is only for photos. 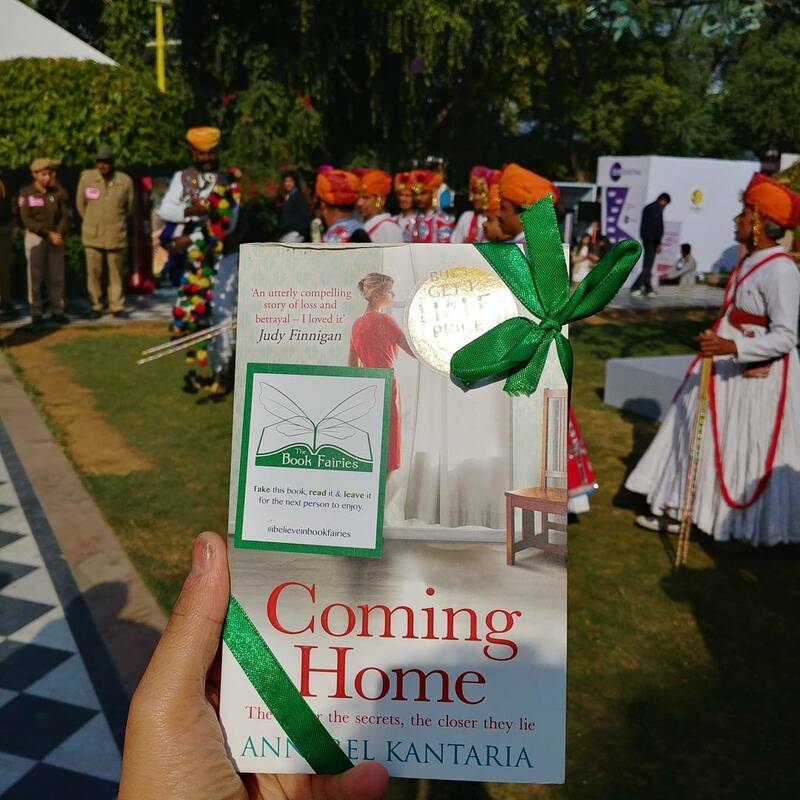 Finally, we decided to bite the bullet, and left a copy of the thrilling Coming Home by Annabel Kantaria, on the platform. It was oddly satisfying but still a bit nerve-racking in today’s era of security and unknown packages. We found a cosy spot nearby to keep an eye on the book hoping to catch a glimpse of its ultimate recipient. We were amused to note that the same security guard had picked it up and was handling it rather delicately while discussing it with another security guard. We found ourselves wondering if we were going be thrown out of JLF for leaving something behind, something that could possibly be perceived as a threat. We went up to them to clarify the issue, and before they could say anything we informed them that this was a present and not a bomb. Laughing, the security guards told us that they weren’t worried about the book being dangerous but rather that it would spoil people’s selfies. It took every ounce of energy to control our laughter! It seems that the essential selfie is more important than someone experiencing even a little bit of joy from finding a book waiting to be picked up. After moving it to an ‘inoffensive’ position, we returned to our strategic spot where not only could we see the book but also saw some literary heavyweights such as Pico Iyer, and William Dalrymple go by. Everyone was gushing over a lady unknown to us who turned out to be Suki Kim, and when we heard her later on, we understood what the fuss was all about. 15 minutes passed but no one had picked up the book. A few people did look at it, but no one ventured to take it. A young child went up to have a look but her mother didn’t let her touch it. Giving up, we made our way to the Mughal Gardens to hear a talk about India in the 18th Century. 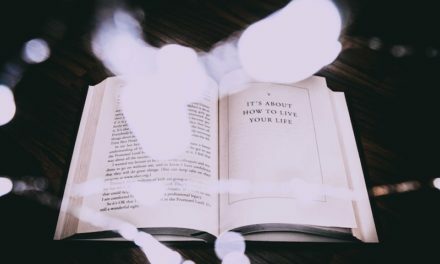 After taking a few steps we turned around to catch one last glimpse of the book only to find that just as a watched pot never boils, it seems a watched book never gets picked up either – someone had taken the book. After losing our book-dropping virginity, there was no stopping us, and we became more and more confident with each drop. Over the next 4 days, we dropped 25 books all over the festival, and at various locations around Jaipur, including restaurants, and shops. Each drop was posted on Instagram and soon others were following us as we hid books. 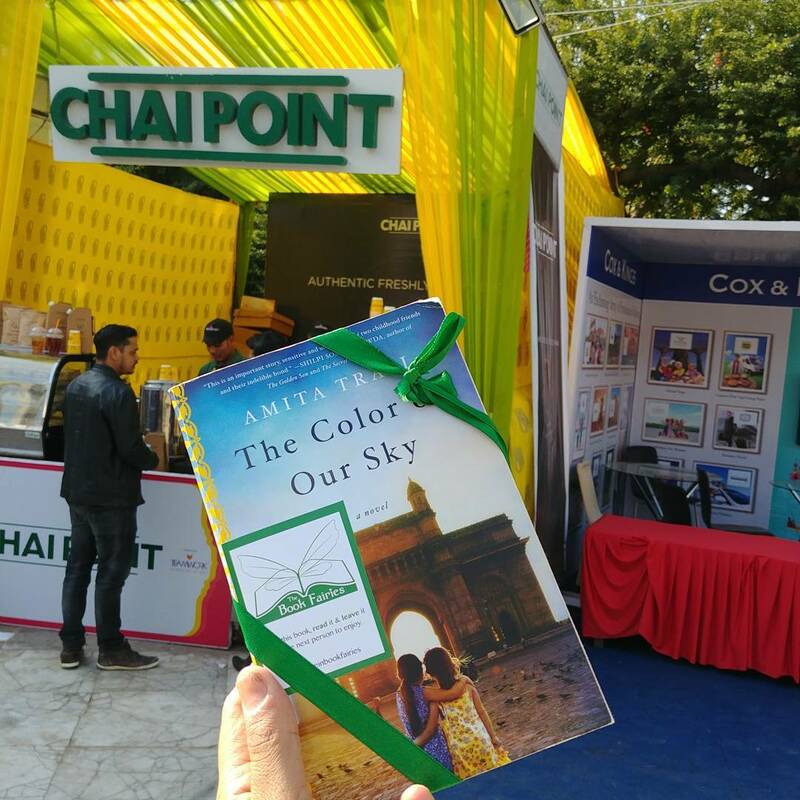 One Instagram user asked if we would be making drops again the next day; another lamented that even though she ran right over to the Chai Point stall in Charbagh to find Amita Trasi’s The Colour of Our Sky as soon as we did the drop, the book was already gone. It was exhilarating. But we were yet to see someone pick up a book. 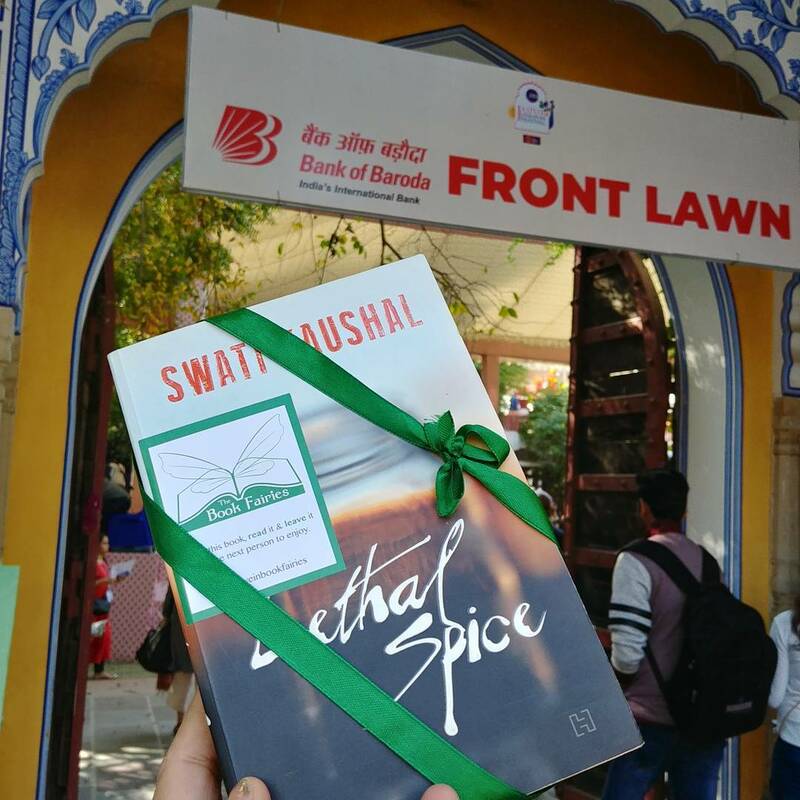 We made our last drop at JLF by leaving Swati Kaushal’s Lethal Spice where the videographer sat at the Front Lawns. It was packed to the rafters and we managed to only find standing space at the back. Given half our mind was on the book, we didn’t pay as much attention to Amy Tan, Chika Unigwe, Helen Fielding, Joshua Ferris and Michael Ondaatje as we would have liked. Unfortunately, no one had picked up the book, and Kaushal’s masterpiece lay there unattended. Once the session was over, the crowd engulfed us and we had to move on. We loved the idea of sharing the joy of reading with someone else, hopefully even converting a non-reader. In a small way, we felt that we were making a difference to someone’s life. If nothing else, we were delighting people by giving them the opportunity to find a book they haven’t read before. Most importantly, perhaps, we were part of a chain that encouraged people to pass the book on to others after they’ve read it. Our first drop may have started off with trepidation but the last few were pure joy. It didn’t matter whether they were poignant works like Em and the Big Hoom or a legal thriller like The Runaway Jury, the popular Manuscript Found in Accra or a Booker Prize-winning novel like The Sellout, we were just happy that through this one small act we were able to make several people very happy. 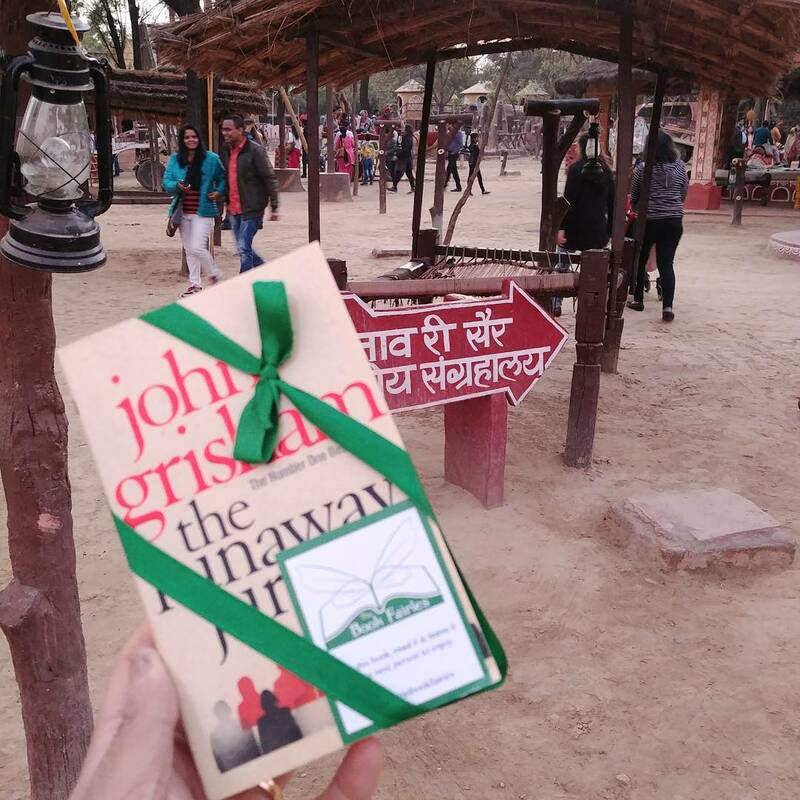 Partnering with The Book Fairies was one of the most rewarding experiences of JLF, and we cannot wait to do it again. And hopefully, next time, we will see someone pick up one of the books. 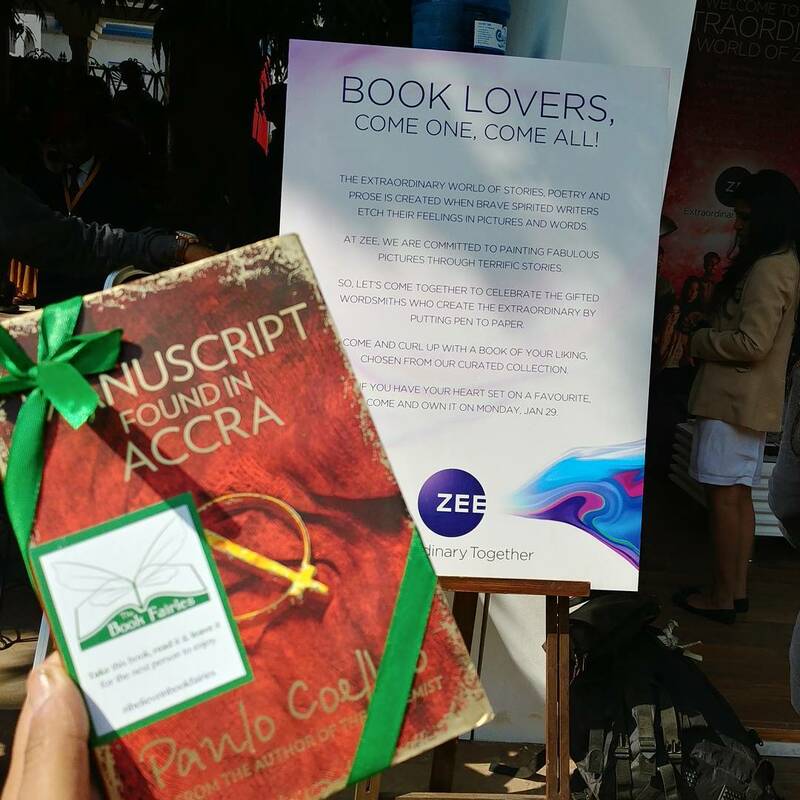 The Curious Reader were the official partners for Book Fairies Mumbai and dropped books on their behalf during the Jaipur Literature Festival 2018. However, the opinions expressed herein are our own. 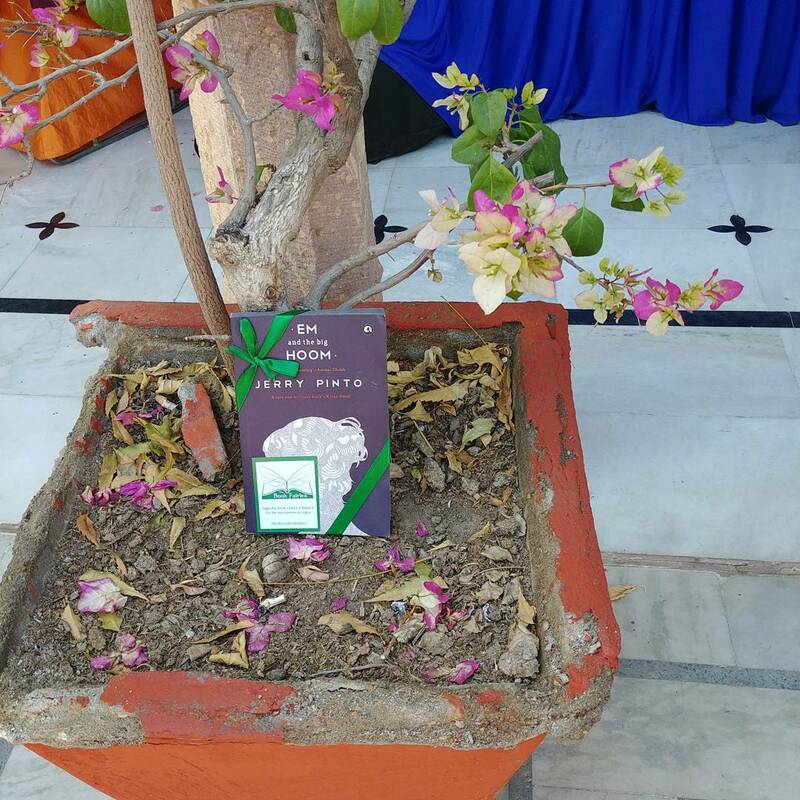 Book Fairies has several chapters all over India. Get in touch with your local chapter to find out how you too can become a book fairy. 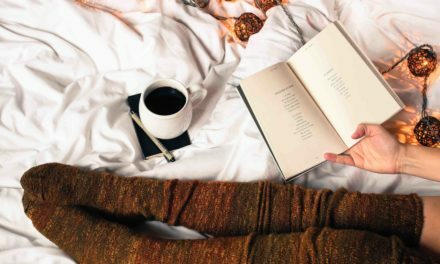 Book Fairies have also launched a book club called The Fairy Book Club. Take a look at some of the books they’ve read. 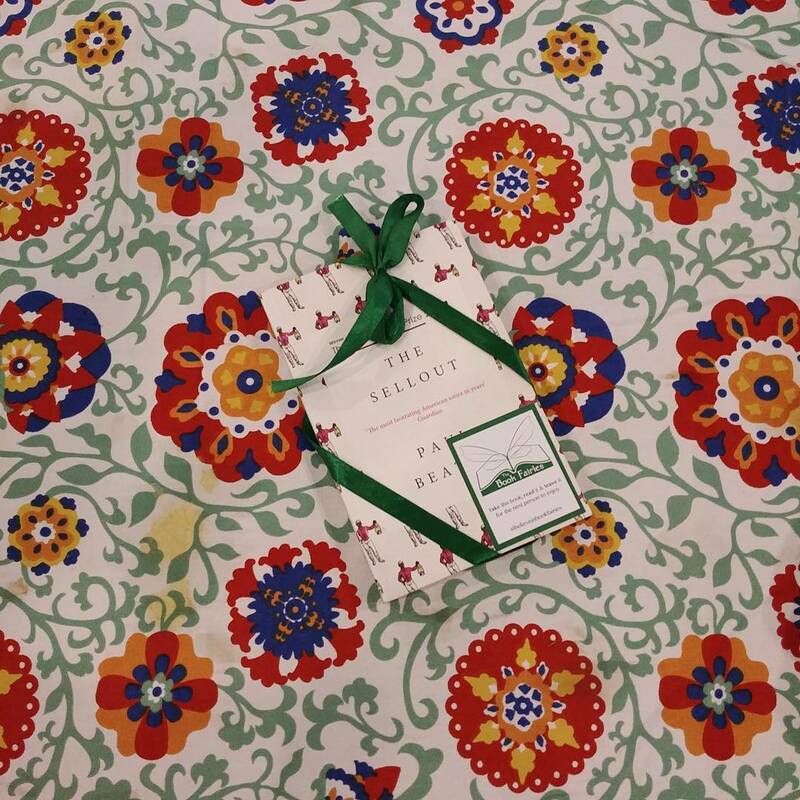 Have you ever found a book dropped off by Book Fairies? Have you ever been a Book Fairy? Tell us about your experience.